First, a little disclaimer: I saw Sing two weeks prior to its release, and I make note of this because this was the first time I was ever invited to a screening as a press member that I could actually attend (most screenings I'm invited to are either in New York City or Los Angeles). I mention this because in nine years I've been at this, this hadn't happened before. I even got a seat with my name on it (which surprised me). Afterwards, someone came up as I was leaving and asked what I thought of the film. "Very sweet," was my comment, or at least the last one I remember saying. It was only later that I thought they were trying to pull a quote from me, but what I said was so innocuous I doubt they could get anything out of it. Now, at last, I'm free to share my thoughts on Sing. It's not original, it doesn't break new ground, yet I loved it. Cute, amusing, with a lot of heart, it's predictable and unapologetic about it. Eternally optimistic koala Buster Moon (Matthew McConaughey) has loved the theater since he was a joey. When he was younger, he bought the theater where he saw the legendary diva Nana Noodleman perform at that theater. However, Buster's ambitions are greater than his audiences, and his shows consistently lose money. The Moon Theater is in danger of insolvency, so Buster cooks up his greatest scheme: a singing competition a la American Idol or America's Got Talent (which I like to point out started out as British shows Pop Idol and Britain's Got Talent, but I digress). Buster hopes that his lifelong friend/sheep Eddie (John C. Reilly) can help him out financially, but Eddie, a ne'er-do-well who is finding life hard due to his inability to do anything, is noncommittal, which is good enough for the ever-optimistic Buster. Due to an accidental misprint by Buster's long-serving secretary, the iguana Miss Crawley (Garth Jennings), what was meant to be a $1,000 prize was made into a $100,000 (a large sum given that Buster doesn't even have the $1,000). The prize money motivates some animals to enter, while others appear to enter because it will give them a chance to sing. After a series of auditions, we get our final contests. Among them is Rosita (Reese Witherspoon), an overtaxed pig with a brood of 24 piglets and a loving but generally inattentive husband who finds herself partnered with wild German pig Gunter (Nick Kroll), Johnny (Taron Egerton), a young gorilla who dreams of singing rather than being part of a criminal gang run by his father, Ash (Scarlett Johansson), a porcupine who thinks she's a punk rocker but who has relationship issues with her boyfriend, and Mike (Seth MacFarlane), a rat who croons beautifully but has a nasty, arrogant disposition. It's hard to resist thinking that Mike was modelled on the actual Seth MacFarlane, but again I digress. One person who wants to participate is Meena (Tory Kelly), an elephant with a simply angelic and powerful voice but who has crippling shyness. Through a series of incidents she finds herself not in the competition, but as a stagehand. As the rehearsals go on towards the actual competition their various lives keep getting in the way. Rosita's joy is tempered by how overlooked and overworked she is as a mother and wife, so to balance things she creates machines to do her duties (to where the family appears oblivious to her absence). Mike lives dangerously, spending money to impress a female rat and cheating at cards with Russian bears. Johnny tries to balance his sensitive interpretations of Sam Smith and a major upcoming heist his father Marcus (Peter Serafinowicz) is planning, and Meena is desperate to get into the show despite her crippling shyness. Things come to a head when Buster finally runs out of money. He thinks that salvation has come his way when he finds that Nana Noodleman is very much alive...but highly cranky. The DIVA of divas, Nana (Jennifer Hudson in her early days, Jennifer Saunders in the present), is a Leontyne Price-type who finds her grandson Eddie as well as Buster and his chipper demeanor idiotic. Despite this, she is talked into being the financial backer of the competition. And YES, I did just name-check Leontyne Price in a review for a children's animated movie. Let's see someone else try that! At the dress rehearsal, Buster pulls out all the stops and it looks like it all might actually come off. However, things go disastrously wrong and they all manage to literally bring down the house. With hopes dashed, it takes the combined efforts of everyone of them to put on the show. As I said, Sing isn't about reinventing the wheel. It is about various creatures at various moments in their lives attempting to live out their dreams, if only for a night. If you do end up rooting for one particular performer to win this competition, the second act manages to pull that out from under you by having that not be possible. This does give us a chance to see our various performers show us what they can do without the cumbersome aspect of seeing one win, the others lose. The singing ability of most of the performers has already been established. Witherspoon won an Oscar for playing June Carter Cash in I Walk the Line (for which she did her own singing). Johansson has sung before (including the Oscar-nominated Before My Time from the documentary Chasing Ice). MacFarlane is known for his covers in the Sinatra-Bennett mode. Kelly IS an actual singer versus an actress. As such, Sing for more established names that are known to have competent singing voices. The two new names added to the 'actor/singer' list are Egerton and McConaughey, two people not known to carry a tune. Hearing our sometime-nutty Texan belt out a bit of Call Me Maybe in a semi-duet with Johansson is amusing (his East Texan drawn still there). However, Egerton is the shocker: his cover of I'm Still Standing had me unconsciously applaud. In the climatic showcase, I found myself applauding at certain numbers (thought not loudly enough to draw attention). 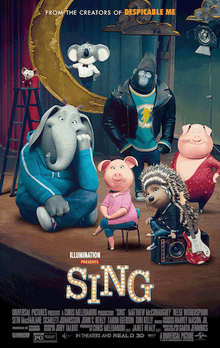 As obvious it the story may be, Sing takes you into its story, perhaps because of its familiarity and because we do end up caring for the characters: the kind but overwhelmed Rosita, the gentle Johnny, the heartbroken Ash, the ever-optimistic Buster, even the arrogant and egotistical Mike. McConaughey can add Sing to his McConaissance (and put that sad Free State of Jones misstep behind us). His Buster was delightful: eternally optimistic, generally upbeat but the motivation not being blind optimism but actual joy at the thought of creating (or recreating) the love he found in the theater. Egerton continues to build an impressive resume as Johnny, the odd man out in a criminal gang (a part that is a bit cliché but he played it well). Witherspoon also excels as that much-harried but loveable Rosita, familiar in her disappointments and joys. I saw Sing in 3-D, and I'm still not a convert to it. I could see where certain parts of Sing were created with 3-D in mind (the opening, the destruction of the theater), and wondered how well it would go over in 2-D. It might make people a little sick, but on the whole it went with the story. There were things I'm not sure would work. Mike serenades his lady-mouse friend with a bit from The Girl From Ipamena, and I'm not sure some adults would get the reference, let alone children. Some of the songs (a cacophony of old and new) will go over people's heads. Still, Sing has enough humor, heart, and wit to it (after Ash does a tearful rendition of Call Me Maybe, sobbing between lyrics, Buster stops her and asks Mrs. Crawley, 'Who'd call her after that? "), along with some really beautiful-looking scenes (Buster's planned opening to his revived singing competition is really exquisite), that I was charmed. I was charmed enough by Sing to find it, yes, very sweet.